We will celebrate this special Guru Puja on Losar (Tibetan New Year) to honor the anniversary of Lama Yeshe’s passing away. Lama Yeshe, the co-founder of FPMT together with Lama Zopa Rinpoche, passed away in the early morning of Losar in 1984. Rinpoche said there is incredible merit in offering tsog on that occasion each year. Guru Puja (Lama Chöpa) is a practice of making offerings and requests to all the Buddhas and holy beings, but especially the root guru, who, according to the teachings, is the root of the path to liberation. This practice of Guru Puja is very profound, with many extra benefits, and is very quick to bring enlightenment. The lam-rim prayer, the prayer of the steps of the path to enlightenment, in Guru Puja has lam-rim and also lo-jong, or thought transformation. 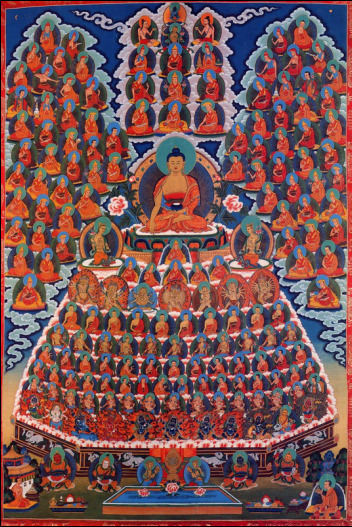 Generally, the whole of the lam-rim, from guru devotion up to enlightenment, is thought transformation. If your mind is not transformed into the path, how can you have realizations of the path? There’s no way, without transforming your mind. All the lam-rim realizations—guru devotion, perfect human rebirth (its usefulness and the difficulty of finding it again), impermanence and death and so forth—are lo-jong, thought transformation. When you say “general lo-jong” it covers everything, but when you say “lam-rim lo-jong” it specifically covers the part of bodhicitta, such as the paths of integrating the lifetime practice into the five powers and the five powers to be practiced near the time of death. The lam-rim prayer in Guru Puja has lam-rim, thought transformation and, after the six perfections, the generation and completion stages of tantra. There are verses that show those paths.